1.Please put the product upright, rotate the outer cover and remove it. Refer to Fig.1. 2.To safe use,please connect the AC adapter first, then conect the DC jack of the base. Refer to Fig.2. 3.Please use the measuring cup to the fill up the water tank. * Be careful not to exceed 200ML water. * Do not add water while the device is working and do not use warm or hot water. 4. Drop in some essential oil. It is better to use 2 -3 drops(0.1-0.15ml) of essential oil for 100ml water. Refer to Fig.3. 5.Install the covers back on and rotate it clockwise until the cover and the base are tightly fastened. Refer to Fig.4. * Important notes: Please cover the outer cover before switch on. 6. Please connect the AC adapter with family user power supply socket. When power on, the aroma diffuser beeps once. At this time, aroma diffuser is in the standby state. 7.If you don't use it for a long time, please pour all the water out, clear up the essential oils,and store it in a dry place. 1. Left key is LIGHT button. a、Press the "LIGHT" button once to turn on the light, and the product beeps, and light cycles automatically. During light cycle, press the key to set preferred color. b、In any time press the "LIGHT" button for three seconds, the light goes out. Refer to Fig.5. 2.Right key is MIST button. a、The first press of "MIST" button in short time, the product beeps and aroma diffuser work as the interval mist mode (work 30 seconds, stop 30 seconds). b、When press the "MIST" button again, the product beeps once, and aroma diffuser run as continuous work mode. c、Press the "MIST" once again in short time, aroma diffuser is off. Refer to Fig.6. 3.If water tank is lack of water, the diffuser will shut off automatically. *Note: When press the function key, the diffuser will beep once to indicate that your operation is finised. 【Calming Mist】- Essential oils have become an important part of many families' lifestyle. 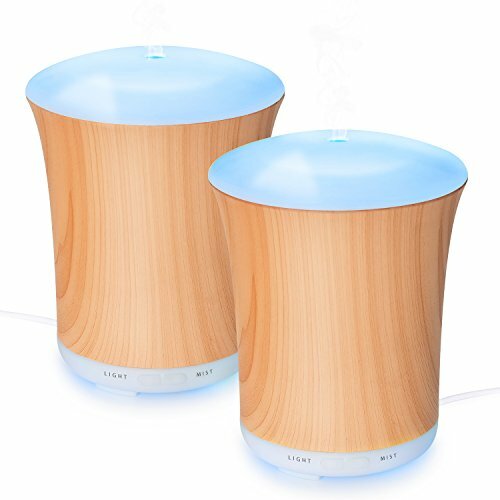 This Essential Oil Diffuser can enhance the effects of those oils and provide a calming effect.And include 8color changing mood lights for your choice. 【Auto Shut-Off】- ZOOKKI diffuser is BPA free, features an enviro-friendly wood grain cover, and has an auto shut-off safety feature when empty. It is safe to use in your baby's nursery, spa, office, etc.